Level 2 Award, having achieved Level 1 in Summer 2016. 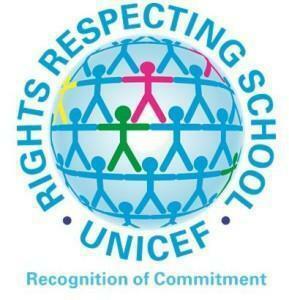 The UNICEF UK Rights Respecting Schools Award (RRSA) is based on principles of equality, dignity, respect, non- discrimination and participation. The RRSA seeks to put the UN Convention on the Rights of the Child at the heart of a school's ethos and culture to improve well-being and develop every child's talents and abilities to their full potential. A Rights Respecting School is a community where children's rights are learned, taught, practised, respected, protected and promoted. Young people and the school community learn about children's rights by putting them into practice every day. Take the time to ask your child what he/she has learnt recently regarding children's rights and responsibilities. Model and use rights and responsibility language with your children. Rights Respecting School Recognition of Commitment.